Nowadays, with the constant bombardment of negative energies, it is a challenge for the Empath to stay grounded. Even when staying home, within their personal sanctuaries, their empathic antennas are constantly switched on, picking up emotional energy from the outside world. Because of this, they easily become drained, consumed with apathy, and distracted from their true Empath roles. To combat the constant overwhelm, the modern world imprints on an Empath, they need to protect themselves and work to stay grounded. Everyone is different and what works for one Empath will not always work for another. But, it has to be said, the best form of protection and way to stay grounded for any Empath is to create a resilient, healthy body, quiet mind and strong energy field. The body is made up of 75% water (somebody tissue has 95%), so it should come as no surprise that this is way up there on the self-healing scale. Many are unaware of just how dehydrated they are. An insufficient supply of water creates problems with the functioning of the energetic and physical bodies, affects general well-being and accelerates the aging process. Water is a powerful protector for the Empath and they need lots of it, both inside and outside of their bodies. Most should be drinking at least 8 glasses of pure water a day just to replenish what the body loses naturally through sweating, urination, etc. The heavier you are the more water you need. I used to believe the saying was a ridiculous bully tactic to force young children to wash behind their ears (which in those days it probably was), but now I see it from another perspective. Water washes more than just dirt away; it has the power to cleanse the energetic body and clear negativity. If you’re skeptical when you come home from a hard day at work try this: instead of reaching for the wine, jump straight in the shower and see what an uplifting and clearing effect it has. Or when feeling emotionally frazzled drink a pint of cool fresh water and see how it dilutes the impact. 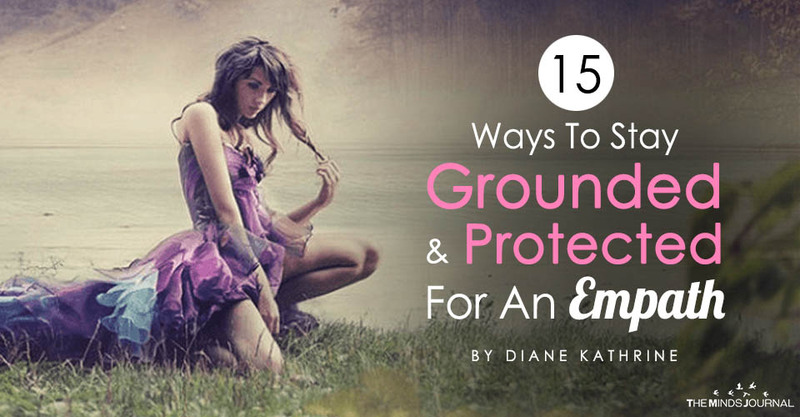 One of the best things an Empath can do, not only for grounding but for all-around balance, is to include more grounding, nutritious foods to their diet and remove any drug-like foods. Wheat is one of the worst offenders. Cutting a long story short: wheat acts like a drug in the body. Empaths react more to drug-like foods than those not of a sensitive nature because they are highly reactive. High reactive are sensitive to different vibrations of energy. Everything is energy vibrating at different frequencies and that includes food, drugs or alcohol: the faster the vibration, the higher the frequency. Empaths are negatively affected by anything of a low vibration. Most drugs and alcohol have low vibrational energy and bring the Empath down fast. Wheat is not classed as a drug, even though it acts like one, and therefore carries the same signature. If you struggle to stay balanced or grounded, even though you do much in the way of self-help: meditation and spiritual practice, exercise and eat a clean, nutritious diet, look to see if you are including wheat. You may not eat bread but still, consume lots of wheat. It is hidden everywhere for the reason it keeps everyone consuming more of it. If you want to learn more about grounding foods and transforming your Empath life, through diet, you may want to read this. Not only is sea salt a great medicinal healer, it is also deeply purifying. It has the power to draw out and dissolve negative energies from the emotional and physical body. This is especially helpful if your day involves interacting with others, where too often you end up picking their stressed or anxious energy. Salt is not only grounding, for the Empath but a hugely beneficial energy clearing tool. By balancing your masculine and feminine energy it works exceedingly well to help keep you grounded and energetically stable. See this post for more information.